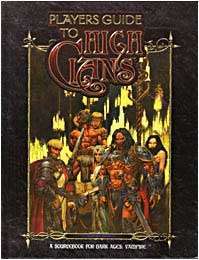 The Players Guide to the High Clans contains detailed information on the Brujah, Cappadocians, Lasombra, Toreador, Tzimisce and Ventrue. It includes hints on running all High Clan or mixed chronicles; how High Clan characters develop over time; the mythology, heraldry and history of the clans; and new Merits, Flaws, and Discipline techniques. Youll also find details on High Clan secret societies and on the High Clan Cainites who command the Dark Medieval world. Hardcover. This title was added to our catalog on October 07, 2004.